The popularity of cupcakes, since their meteoric rise to stardom, has not waned. Pinterest has thousands upon thousands of boards dedicated to these individual portion sized cakes. 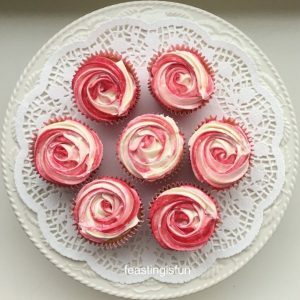 Type cupcake recipes into the browser on your computer/phone/tablet and you will find endless recipes, for every type of cupcake you could ever want. Or so I thought! 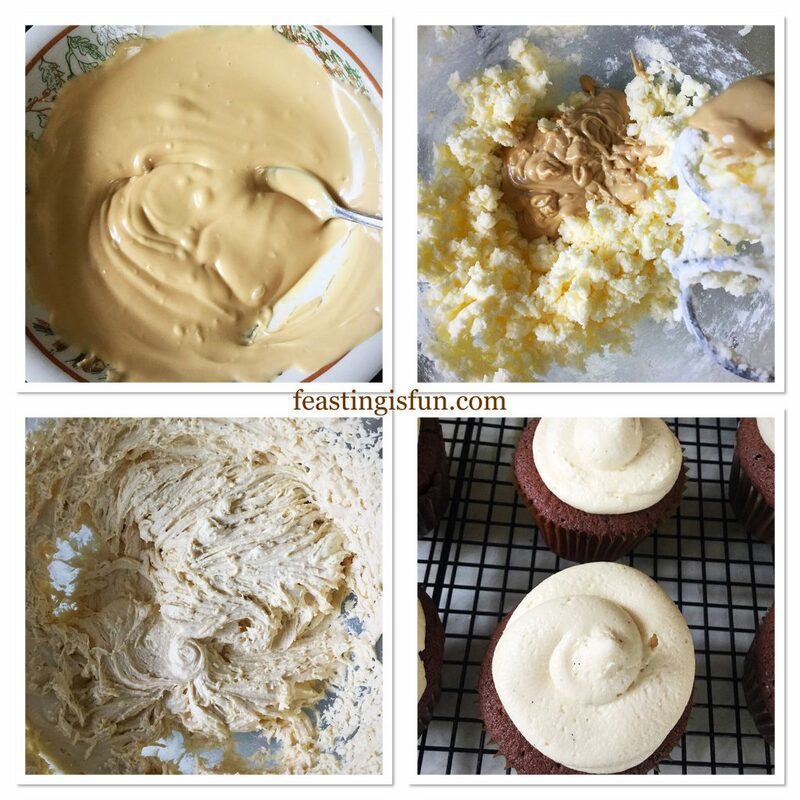 While there are recipes for Caramac cupcakes, including a fantastic recipe by my friend Jane, there weren’t any chocolate/Caramac combinations. 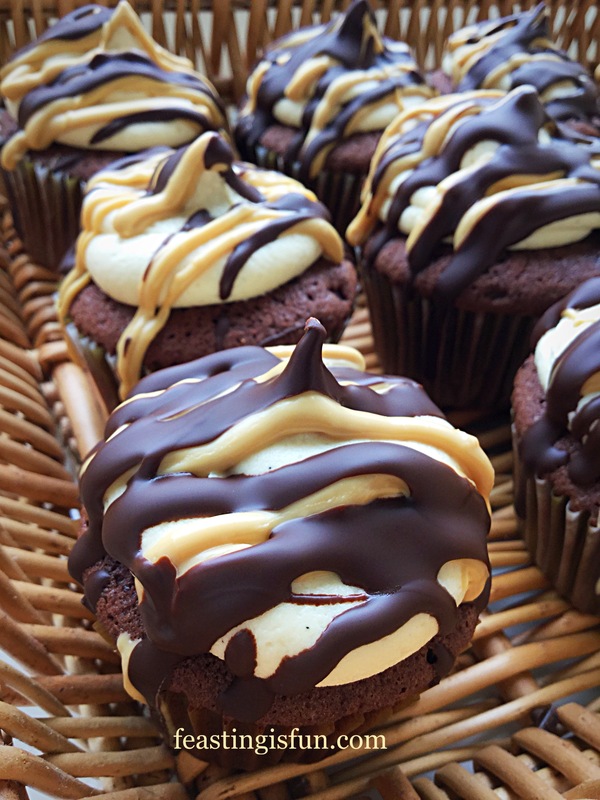 Resulting in the creation of these Caramac Frosted Chocolate Cupcakes. Caramac in itself is a lightly caramel flavoured white chocolate. While it is completely delicious, it tends to be rather sweet. 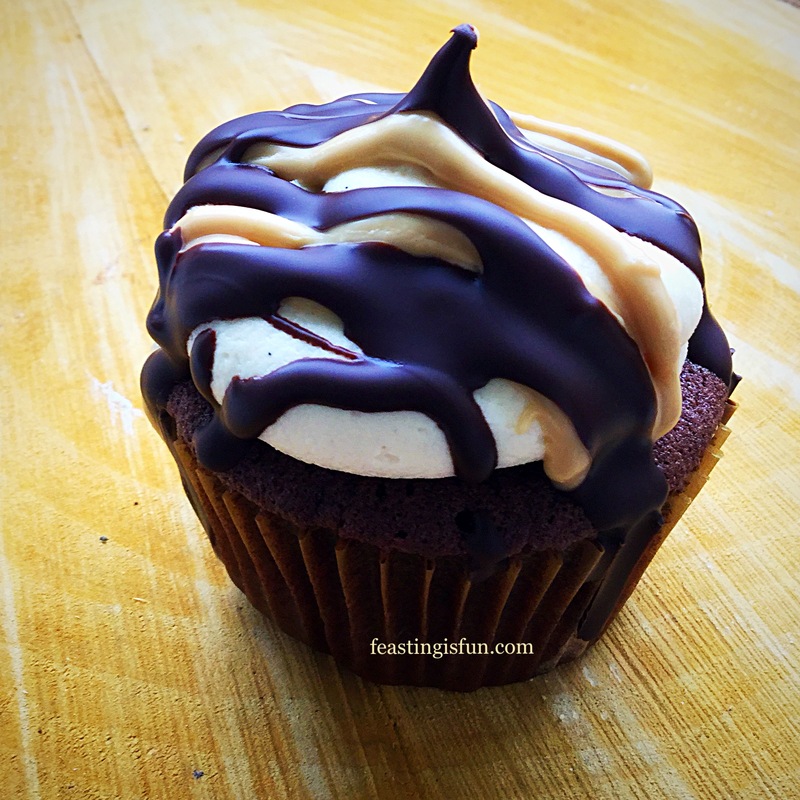 Combining Caramac frosting with a dark chocolate cupcake balances both flavours out. Similarly, with the drizzle. Slightly bitter dark chocolate is enhanced by the sweet caramel from the Caramac. Resultying in a perfect flavour combination. Delicious and very more-ish. Could you stop at one? Pretty, individual portions of caramel and chocolate in a cake. 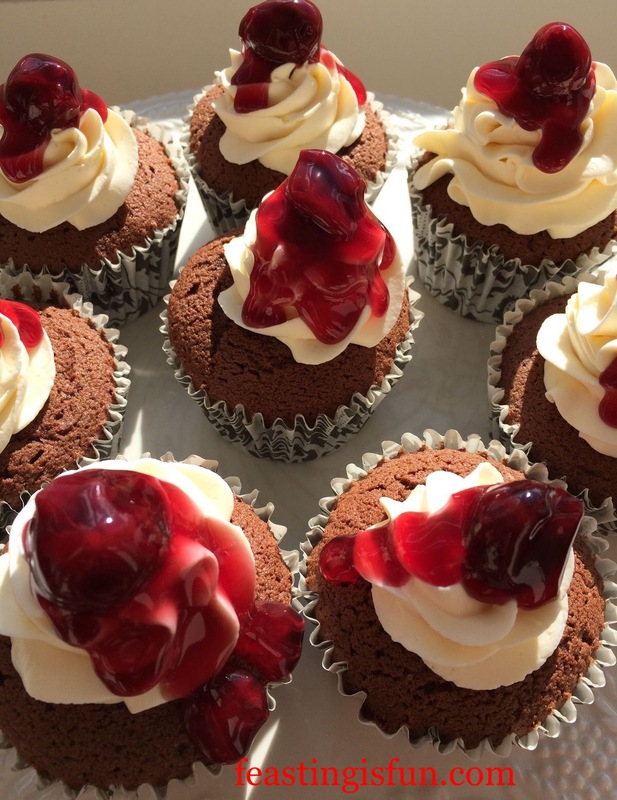 These cupcakes are elegant enough to be served for dessert, or alternatively, handed around at a party. You will need two, deep, 12 hole cupcake/muffin tins. Line one tin completely with cupcake cases and the central 6 holes in the other with cupcake cases. In a large bowl add butter, caster sugar and sea salt. Whisk together until pale and creamy. Sift in the flour, cocoa powder and baking powder. Then add the milk. Whisk together until just combined. The chocolate colour should be uniform and no streaks or lumps present. Scoop a heaped dessert spoonful of cake batter into each cupcake case. 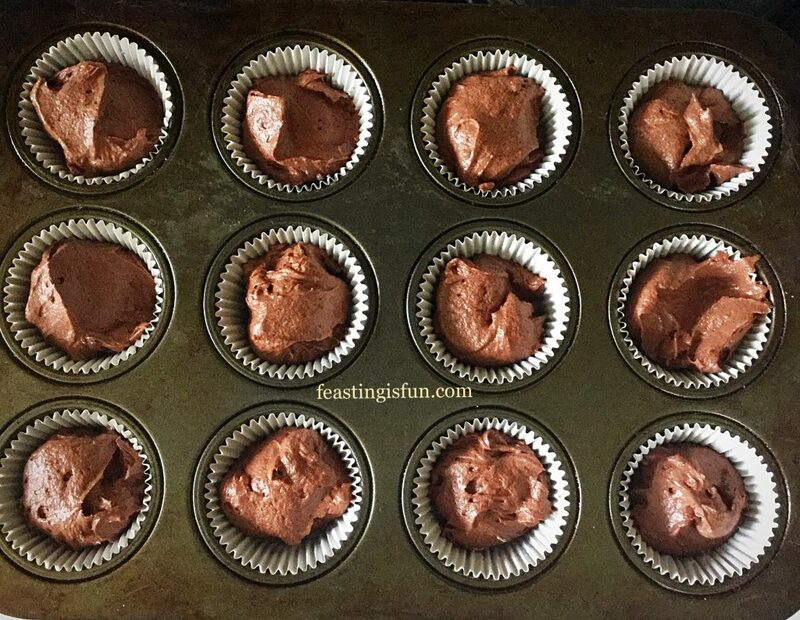 Do not worry if the batter doesn’t fill 18 cupcake cases. Mine stretched to 17. Most importantly, each cupcake case should contain equal amounts of cake batter. Chocolate cupcakes ready for the oven. Place both cupcake tins, evenly spaced, into the preheated oven. Bake for 20-25 minutes. The cupcakes are baked when they are risen and spring back from a light touch. When baked remove the cupcakes from the oven. 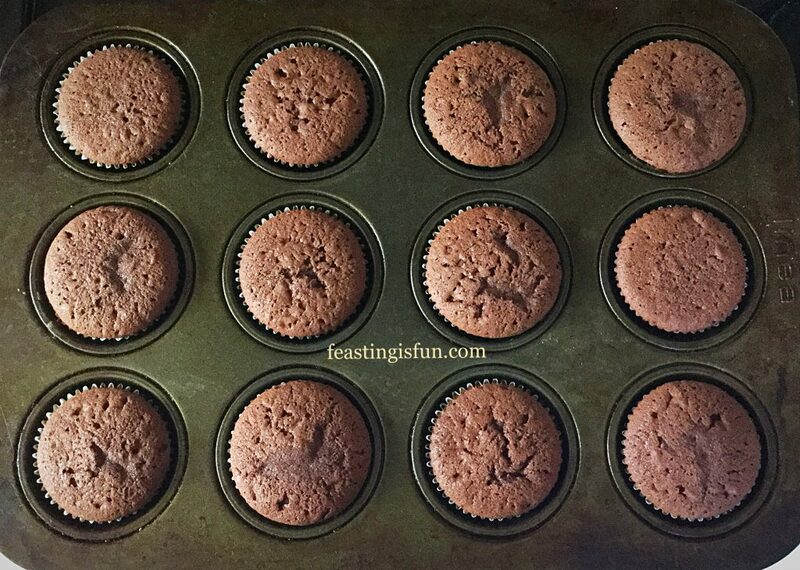 Leave the cupcakes to cool for a couple of minutes in the tin, then remove and place them on to a cooling rack to fully cool. Place the Caramac buttons into a heatproof, microwaveable bowl. Heat for 20 second bursts, stirring between each one. Remove from the microwave once the Caramac is completely melted. Into a large bowl add the softened butter, salt and icing sugar. Whisk, adding the hot water whilst the beaters are whisking. Continue whisking until the buttercream is combined, yet still thick in consistency. Add the melted Caramac to the bowl and keep whisking until the mixture is smooth, light and creamy. Into a large piping base fitted with a 1cm round nozzle tip ( I use Wilton number 12 carded round tip ), add the whipped Caramac buttercream. Using both hands to guide, pipe a double swirl. Start in the centre of the cupcake, pipe one swirl, then pipe a second swirl on top. Press the nozzle down into the centre and pull away. Practice on a sheet of parchment paper first and then scrape the buttercream back into the piping bag. Making the Caramac buttercream and icing the cupcakes. 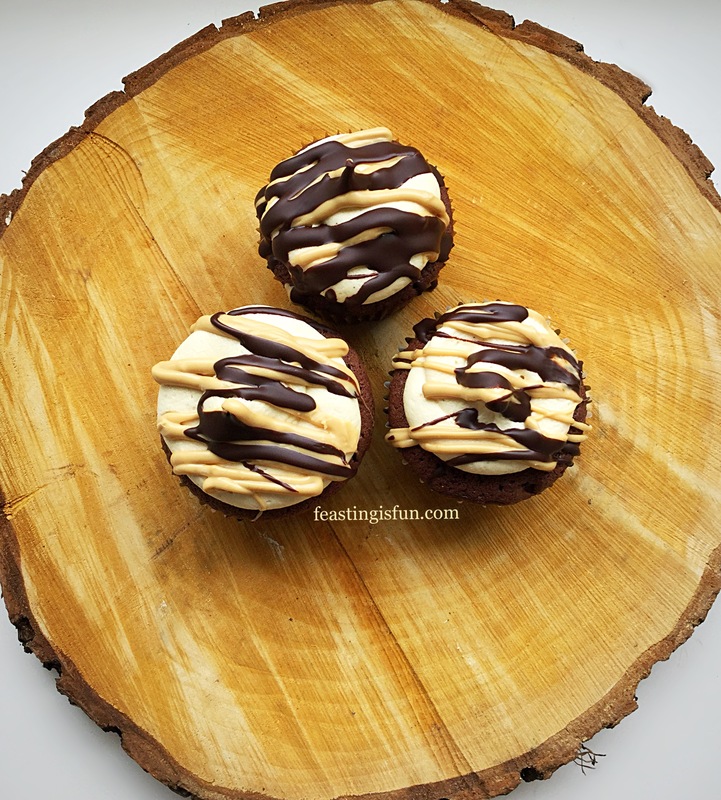 While the frosting on the cupcakes sets, prepare the chocolate and Caramac drizzle. Into separate heatproof, microwaveable bowls place the Caramac buttons and then the dark chocolate chunks. Prepare 2 small, disposable piping bags, as seen in the photo. Open up each bag and place into a small tumbler, ensuring the edge of the bag folds over the side of the glass. Doing so makes pouring the melted chocolate/Caramac into the bags easy and reduces the risk of burning yourself with hot, melted chocolate. Heat the chocolate and Caramac as for the frosting, stirring between each 20 second burst in the microwave. Once melted pour into the prepared piping bag. Starting with the Caramac, twist the top of the bag and then snip the end of the bag off, leaving a small hole. 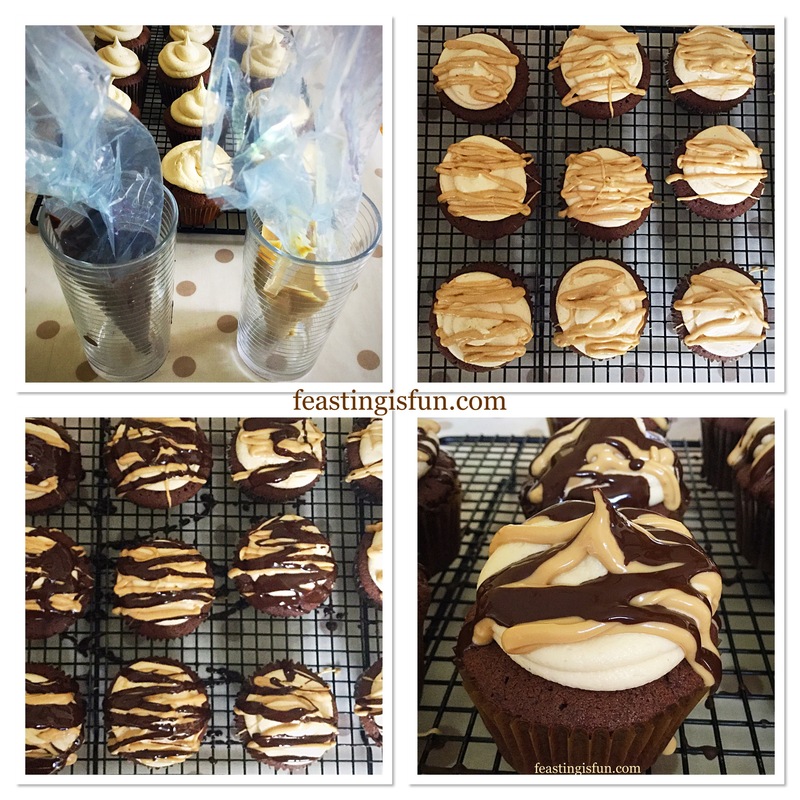 Pipe melted Caramac on to each cupcake using a zigzag pattern. 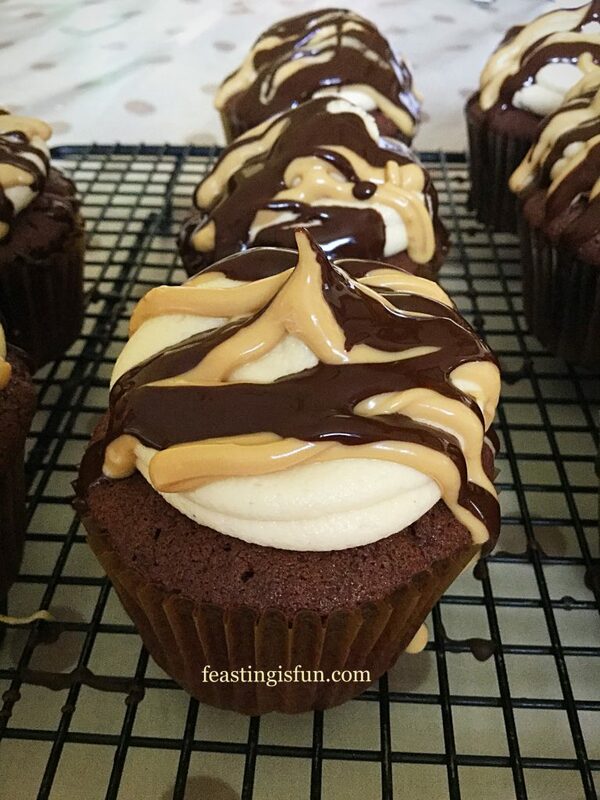 Since this is a drizzle, melted Caramac (and also chocolate) can go over the sides of the frosting on to the cupcake. Repeat the same process using the dark chocolate. 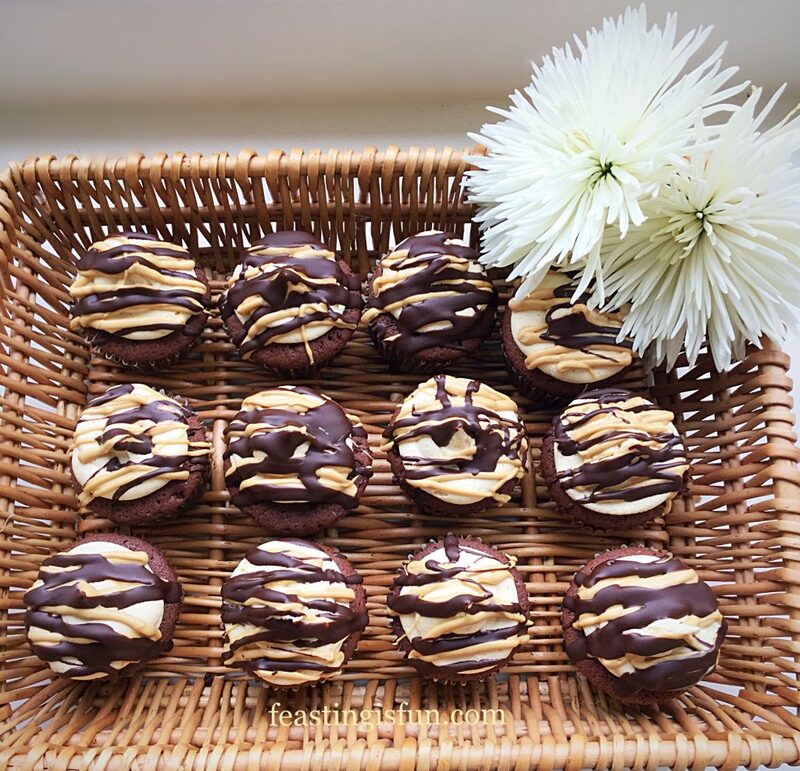 Double Drizzle on Caramac Frosted Chocolate Cupcakes. No two cupcakes will look identical. Don’t worry, each cupcake’s individuality is part of its appeal and charm. Piping the chocolate and Caramac drizzle on to the cupcakes. Place the cupcakes somewhere cool to set. During warmer months pop in the fridge for a few minutes. 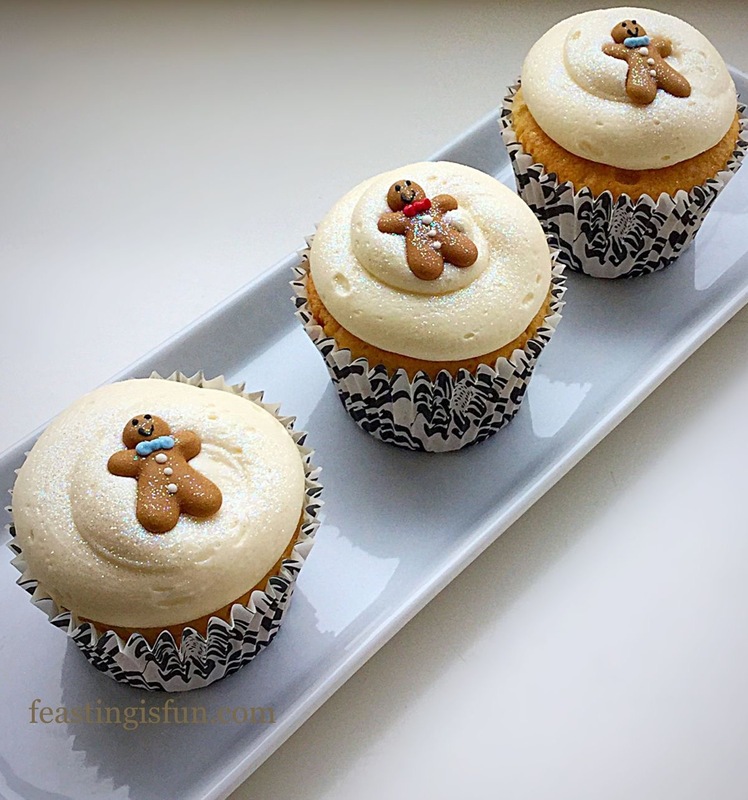 Invite friends over and serve these cupcakes with a smile and a hot drink. Alternatively, package some up in a box and take to work to share with your colleagues. 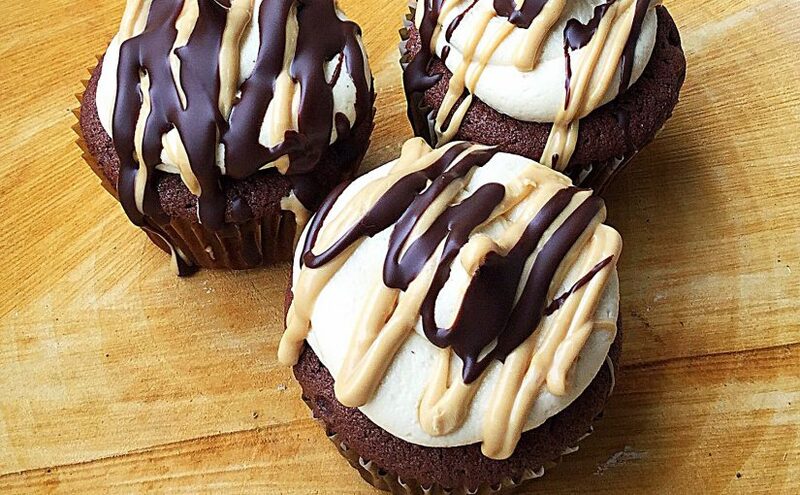 Since these cupcakes are so delicious, it really would be a shame not to share them. Store in an airtight container and eat within 5 days. During very warm weather store in the refrigerator. 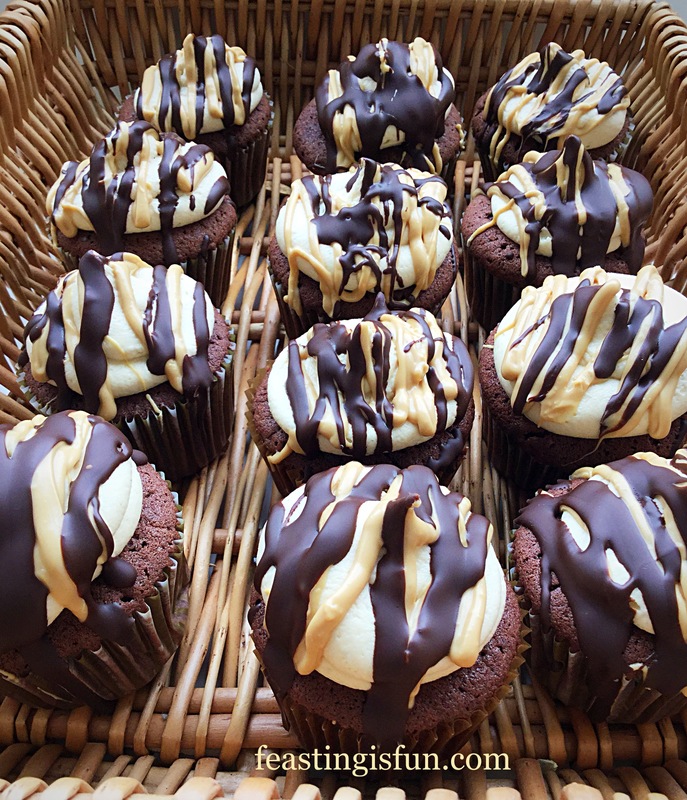 Since the flavour combinations are virtually endless and each cupcake is an individual portion size, it is easy to see how they have remained so popular. In addition, each cupcake, especially when homemade, is unique. Also, they are just so pretty. Whether embellished with sprinkles, drizzles, little figures, flowers or simply piped with buttercream, the appeal of having a cake all to ourselves is such fun. Resulting in the perfect feast. No part of this blog post may be copied or reproduced without the specific written permission of the owner. Please see my Disclosure Policy .